Masculine, stylish and above all, comfortable house socks dedicated to the fine art of relaxing, Falke Lodge Homepads Cotton Socks are made in a mottled, lightly slubby 93% cotton rich yarn, very slightly cushioned with a looped pile inner, and with a suitably hard-wearing, non-slip silicone tread pattern on the soles. 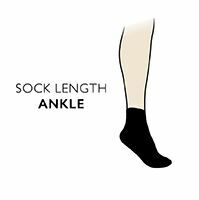 The socks are manufactured in an anatomical left/right biased ergonomic shape, so they fit the foot perfectly, and are durably reinforced at the areas of highest impact. Leather-look Falke pull-up tabs on the backs of the cuffs give these sneaker-length socks extra rugged appeal.